Happy Pi Day! With a family of math enthusiasts (especially my husband and my older daughter) and food enthusiasts (pretty much all of us), Pi Day is a lot of fun, celebrated by eating pie, of course. Plus there’s a bonus: today is the ultimate Pi Day–because not only is it 3/14, it is 3/14/15, the first few digits of pi. While my oldest daughter is into pie/pi, my youngest isn’t as thrilled with either. She just doesn’t love pie, so I make this apple pie with a gluten-free crumb coating — a cross between apple pie and apple crisp — in hopes of tempting her to eat some of it. If you are gluten-free, be sure to use certified gluten-free oats, as regular oats have too much cross-contamination with gluten-containing grains. 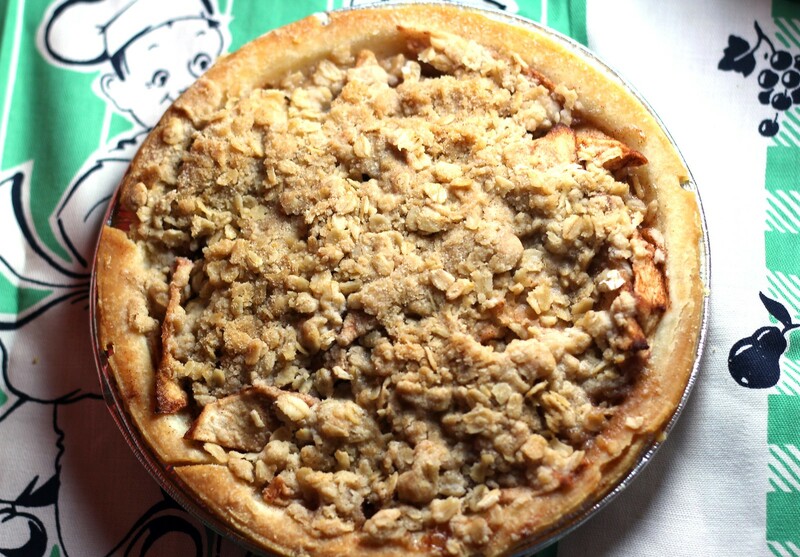 If you prefer a traditional pie, feel free to make this apple pie without the crumble topping. Just make the apple filling as directed and dot with 1 tablespoon of butter or dairy-free alternative before placing in the oven. This apple crumb pie can be made gluten-free, dairy-free or vegan (just check the ingredients of your pie crust). In a small bowl, mix together sugar, cinnamon and nutmeg. Peel, core and thinly slice apples, place in a large bowl and sprinkle with cinnamon-sugar mixture. Stir in tapioca starch and lemon juice. Fill pie crust with apples. To make the topping, place gluten-free oats, brown sugar, brown rice flour, tapioca starch, cinnamon and salt in a medium bowl; stir to combine. Add diced butter, and work in with a pastry blender or two forks until the mixture resembles coarse crumbs. Crumble topping over pie. Place in preheated oven and bake about 45 minutes until filling is bubbly.